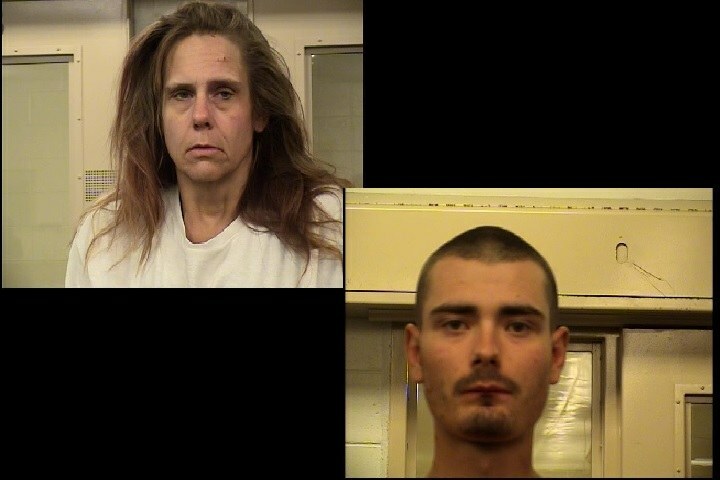 Curtis Otero and Tanya Serrano were arrested and charged with multiple felony charges after being caught in a stolen vehicle equipped with LoJack. Curtis Otero, 23, and Tanya Serrano, 42, were arrested and charged with multiple felony charges after being caught in a stolen vehicle and attempting to car jack another vehicle foiled by the start switch. On 03-21-2017 Albuquerque Police Department Auto Theft detectives received a LoJack signal from a stolen vehicle equipped with the LoJack system in the area of 910 Louisiana Blvd. Detectives soon located this vehicle in the area and observed it to be a blue Chevy with a female driving the vehicle who was later identified as Tanya Serrano, along with 3 other occupants. Detectives requested air support to assist with the tracking of this vehicle. BCSO Air Support arrived in the area to assist while APD marked units attempted a traffic stop of this vehicle. The vehicle failed to stop and fled from officers. At this time, marked units were removed from the area in an attempt to keep the community safe and allowed the air support unit and undercover detectives to track the vehicle. During this time several other agencies also received this LoJack signal and called APD dispatch to alert them of this information. The Air Support Unit was able to track this stolen vehicle into various areas around Albuquerque which eventually lead them to the Sunport airport where the vehicle went into an underground location. This caused the air support unit to lose visual of the offender however undercover detectives were still in close proximity of the stolen car and were instructed to follow this vehicle into the underground area. A citizen was in this area with his BMW to pick up friends who flew in from out of town. He told police a young male later identified as Curtis Otero demanded his BMW at gun point. Detectives arrived and observed Serrano and Otero get into the vehicle and appeared they were attempting to flee. A second female ran into the airport but was soon located and another male occupant of the original stolen vehicle was also located and both were detained. Detectives and officers were able to get all the suspects into custody before they were able to leave the area and without incident. Detectives found the handgun used during this crime in the BMW and discovered the reason Serrano was not able to elude police from the underground area was because she did not know how to start the BMW. During the interviews it was discovered the two other passengers had asked for a ride from Serrano earlier in the day and once Serrano ran from police they had asked repeatedly to be let out of the vehicle and were held against their will. This was confirmed in other statements as well. Serrano said she was renting the blue Chevy from a friend for $20 a day. Serrano was arrested and charged with Robbery, Aggravated Eluding, Tampering with Evidence, Conspiracy, Kidnapping, and Receiving/Transferring a Stolen Motor Vehicle (2 counts). Otero was arrested and charged with Robbery with a Deadly Weapon, Aggravated Eluding, Tampering with Evidence, Conspiracy, Kidnapping, and Receiving/Transferring a Stolen Motor Vehicle. We want to thank the Bernalillo County Air Support Unit for their assistance and the LoJack company for providing us the tools we needed to make this arrest. This was a great apprehension by the APD Auto Theft Unit that got two violent suspects off the streets. We will work closely with the District Attorneys office to ensure these suspects face the justice they deserve.